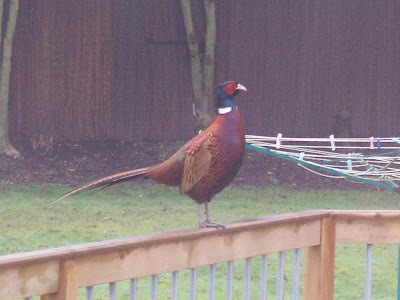 This fat pheasant was making himself at home in the back yard of my cousins house in England over Christmas. My dad would have liked to take a shot at this guy. 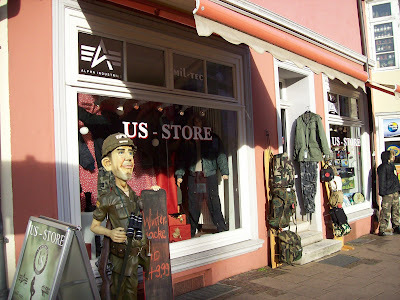 On my first week in Lueneburg, I was puzzled by the store known as the US Store and I have written about it before. I was then and am now unhappy that at least one image that Germans have of Americans is of gun-toting, camouflage-wearing, goofballs - however self-inflicted that view of the US might be. See the bottom photo above. Over the months that I was there, however, I began to appreciate that Germans I met had a complex understanding of the US and not one that was naive. They do tend to focus on the more bizarre American behavior but, heck, so do we. At top is a photo of Hemingway's, a great bar/restaurant devoted to the memory of Papa Hemingway. Over the door, you can see his smiling visage. the walls inside are covered with large photos of Hemingway in Paris, fishing, hunting, writing, traveling, etc. 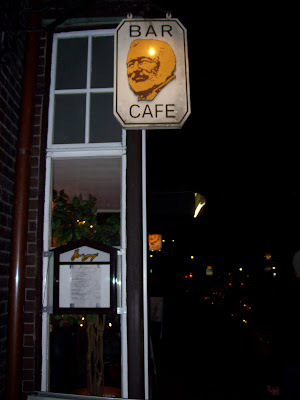 I am a great Hemingway fan and spent nearly a half hour wandering around the restaurant, which has a kind of Key West motif, looking at each photo in detail. I think it is great that while Germans might be able to make use of some unfortunate perceptions about the US, they can also appreciate and celebrate an American literary great. When have you seen an American restaurant devoted to Gunter Grass, Heinrich Heine, or Goethe? 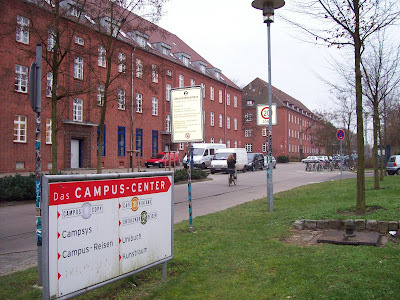 I realized now that I am back in the US that I had not posted any photos of the campus at Lueneburg. 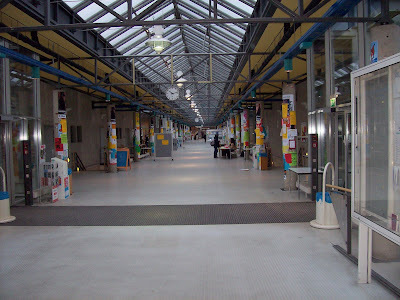 While there are three campuses, this is the main one. UL has about 10,000 students. 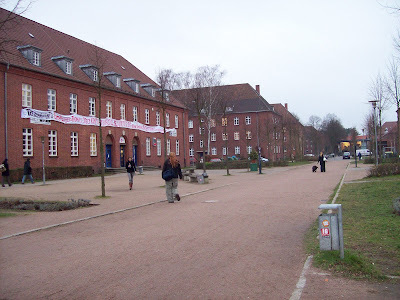 The main campus is the former home of the British Army. The campus thus has this organized and predictable military style about it. But in the summer with ivy growing on the buildings and with all the trees, it is a very pleasant place. I traveled a lot by train while I was in Deutschland. 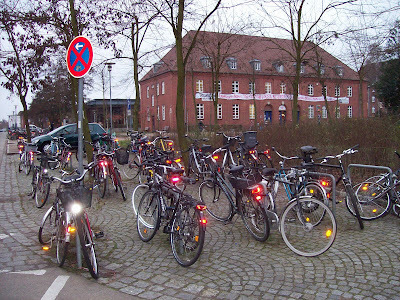 The trains in Germany are very accessible and go nearly everywhere you would want to go. If you plan ahead ticket prices are not bad. My round trip ticket Lueneburg to Munich, for example, was about 90 euros, or about $120 and the ticket to Berlin was 49 euros. There are different types of slow and fast trains. The RE trains are the slowest. Next up is the ME, known as the Metronome trains in Lower Saxony. The ME are double-decker trains that made good time and I often used them. Then you get into the IC trains, Intercity, or ICE, Intercity Express. 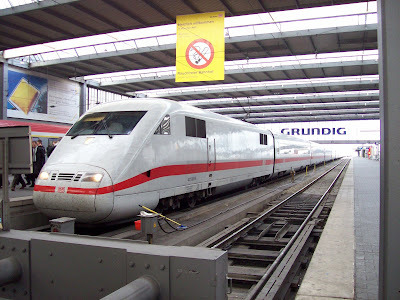 From Hamburg to Berlin, the ICE train pictured above did over 130 mph and covered the distance in about an hour and a half without a stop. Very cool. 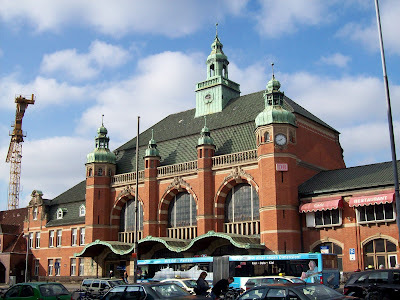 At the top of the photos is the train station in Lubeck. A historic building it is undergoing an extensive renovation inside. 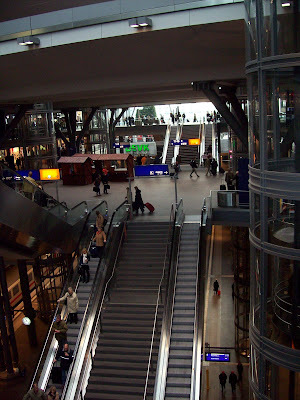 The next two photos going down are from the central Munich train station or Hauptbahnhof (main train station.) 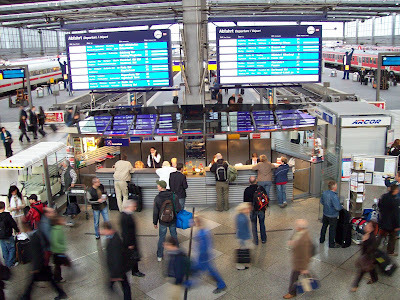 The next photo is from the very busy Hamburg station and you can see the rows of trains arriving and departing. 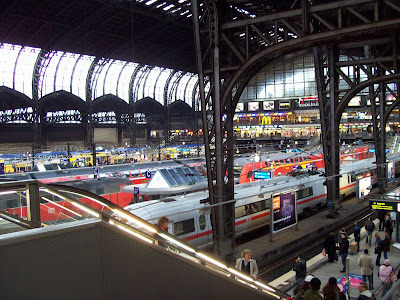 At bottom is the newest and largest train station in Germany in Berlin. It is so big that it was hard to take a photo to do it justice. In this shot you can see the multi-levels of shopping with the trains at the very bottom.